Diver-Assisted Suction Harvesting (DASH) is a relatively new technique that can be used to manage aquatic invasive plants (AIPs). DASH uses SCUBA divers to identify and hand-pull intact AIPs out of the sediment of an inland lake and can be effective in certain situations. However, careful consideration of site-specific characteristics is extremely important when determining whether DASH can be successful in a particular area of a waterbody. If DASH is conducted in areas with unfavorable site characteristics, performed by inexperienced people, or undertaken without the proper equipment there is the potential to unintentionally spread invasive species, remove native vegetation, and disrupt benthic sediment and habitats. DASH, its impacts, and permit requirements will be discussed. Eric Calabro is an Environmental Quality Analyst with DEQ’s Water Resource Division. He provides technical expertise and assistance to regulatory staff and the general public on inland lake and shoreline permitting and issues. 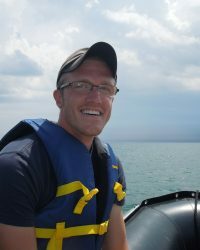 Eric also works on refining and advancing the protection and restoration of shorelines and shallows through work on bioengineering, habitat, and AIS projects; and has scientific diving experience in the Great Lakes and inland lakes of Michigan.